If you have a whole household's worth of stuff to sell, or very nearly, considering billing your sale as an estate sale. Though estate sales are frequently associated with the estate left by a deceased person, living estate sales are fine too. If you're moving and leaving most of your goods behind or doing extensive redecorating, for example, your sale is a legitimate estate sale. Estate sales are typically held indoors, but don't do if you can't clear some or all of the rooms and lock those without sale items. If it's not possible to hold the sale inside, you can use the garage, storage sheds, and the front and back yards. Estate sales are better suited than yard sales for selling antiques, collectibles, and good vintage pieces. Estate sale merchandise typically includes furniture, artwork, accessories, linens, kitchen goods, appliances, and garden ornaments and tools. Clothing, shoes, hats, handbags, and good costume jewelry are also appropriate goods for an estate sale. 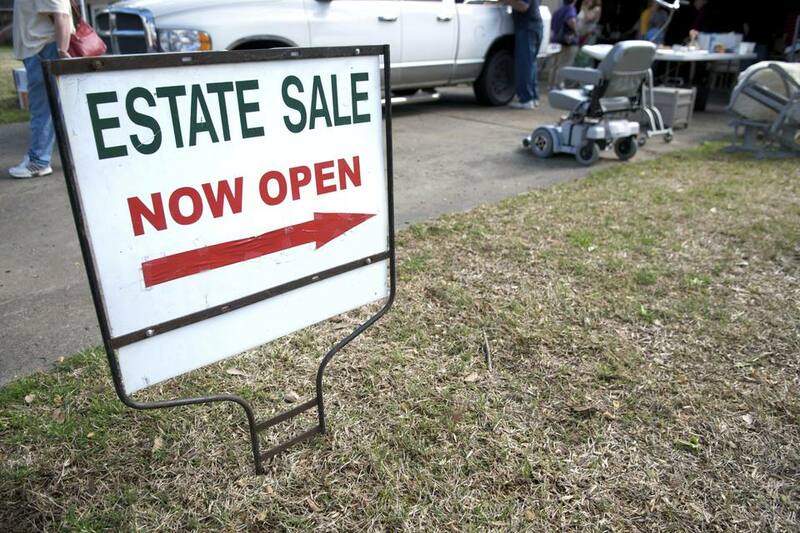 You can organize your estate sale on your own or contract with an estate sale company. If you opt for the latter, part of your profits will go to the company, but you'll save yourself lots of work -- and you'll probably get higher prices. Though they're always hoping for a great deal, shoppers typically expect estate sales to have higher prices than yard sales. They also expect the merchandise to be abundant and of better quality than the standard yard sale offerings. Because estate sales close for business once the sale ends, shoppers know they can't postpone buying pieces that interest them. You'll need a minimum of three people to work your estate sale. You'll need a designated person at a check-out table near the entry /exit door. You'll also need at least two people to move through the different sale areas to answer questions and discourage thieves. Ideally, station someone in each room or area so the goods are within sight at all times. If you have your estate sale inside, or in multiple outdoor areas, you can't keep your eye on all of the customers at once. Display small pieces, such as jewelry and silver flatware, near your check-out table. Thieves shop estate sales because they're hard to police, and you don't your small, pricey pieces leaving the property in someone's pocket. If you're holding the estate sale inside and the space is small, consider limiting the number of people you admit at one time, especially during the first hour or two of the sale. The first hours on the first day of the sale usually attracts the greatest number of shoppers. Unless you've got a few white elephants you're trying to unload, don't haggle on the first day of the sale. Instead, plan to accept offers or mark the goods down by a certain percentage during the last half of the estate sale's final day. Post your policy and discount plan on signage placed at the estate sale location, and in the print and online advertisements you place. If you don't hire an estate sale company to price and run your sale, research the value of antiques and potential collectibles before pricing them. The pieces you consider valuable may not be, and some of your so-called junk may be worth more than you think.